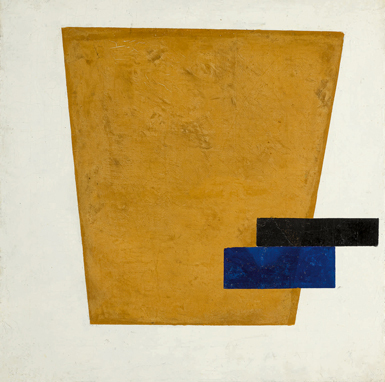 Kazimir Malevich’s Suprematist Composition with Plane in Projection (1915) had a pre-sale estimate of $12 million – $18 million, and sold for $21.2 million. Sotheby’s pulled in $173.8 million during a muted Impressionist and modern art evening sale in New York tonight that notched a few artist records but also saw 13 of 50 lots fail to sell, for a middling sell-through rate of 74 percent by lot. The sale had the exact same number of lots as the corresponding sale at Christie’s a night earlier, but Christie’s beat Sotheby’s by well over $100 million. Tuesday’s sale did outdo the night’s low estimate of $147 million, a figure that had to be adjusted when the night’s top lot, Egon Schiele’s Danaë (1909), was withdrawn prior to the bidding. It had been estimated to sell for $30 million to $40 million. Still, there were a few highlights. Without the Schiele to take top honors, the night’s biggest lot was Kazimir Malevich’s Suprematist Composition with Plane in Projection (1915), which sold for $21.2 million over a high estimate of $18 million. There were also artist records for Jean Arp, Germaine Richier, and Diego Giacometti, and a record for a sculpture by Max Ernst. Alberto Giacometti’s Buste de Diego (ca. 1957, cast 1957–58) had a presale estimate of $10 million–$15 million, and sold for $10.9 million. The bidding whittled down to a back and forth between Cappellazzo and Dubin, until Chinn came back in, pushing the hammer price to $14 million, at which point Dubin finally secured it, making the final price $16 million with the buyer’s premium. That shattered the high estimate of $6 million, and eclipsed the former record for an Ernst sculpture six times over. “It was a great night for sculpture, it was well in excess of the $41 million high estimate,” Evarts said after the sale. Indeed, the sale’s biggest success came when it stuck to sculpture, especially work from the collection of Laura and Davin Finn, who was a founder of the PR firm Ruder Finn. From that batch of work, Jean Arp’s Toorse des Pyrénées (1962) went for $4.9 million, smashing its high estimate of $2.5 million, and Henry Moore’s Seated Woman (1960) went for $7.4 million, well over its high estimate of $6 million. And though it wasn’t in the Finn collection, Alexander Archipenko’s Seated Figure (1917) sold for $564,000, almost quadruple its high estimate. “This is the strongest sculpture market we’ve ever seen,” said Helly Nahmad, a few minutes after his family spent $7.1 million on Georges Braque’s La Pianiste (1937), which is a painting. Claude Monet’s Le Bassin aux nymphéas (ca. 1917–20) had a presale estimate of $14 million–$18 million, and sold for $16 million. There was some trepidation in the room by the time Helena Newman, the chairman of Sotheby’s Europe and the night’s auctioneer, wound her way to the Malevich at lot 32. Apart from the surprising success of the Ernst, the other eight-figure lots of the night didn’t exactly inspire rousing market confidence—the late Picasso Tête d’homme (1969) saw senior vice president Clarissa Post beating out the underbidder, the seated advisor Christophe Van de Weghe, with a price of $10.9 million, well below its high estimate. 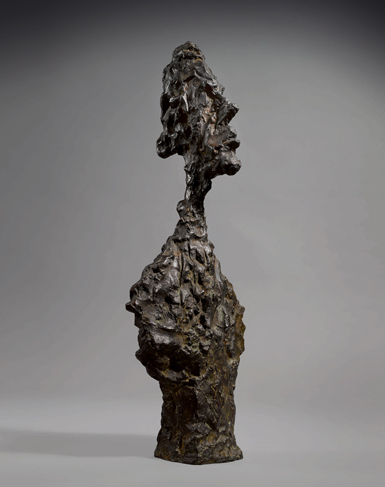 Alberto Giacometti’s Buste de Diego (1957–58) just squeaked over its low estimate of $10 million by selling for $10.9 million against a high estimate of $15 million. And then senior client liaison David Rothschild essentially conducted a private sale in front of a few hundred people: he was the only bidder on Monet’s Le Bassin aux nymphéas (1917–20) and secured it for $16 million in the dead room. And so it seemed ominous when, after Newman began the bidding on the Malevich at $9 million, no one on the rostrum or in the room came in with an offer. But then Lisa Dennison, chairman of Sotheby’s North and South America, blurted out a bid of $11 million, with contemporary art head Grégoire Billault and Sotheby’s Russia director Alina Davey coming in after her. Dennison soon dropped out, leaving Davey and Billault to battle until Alina gave up when Billault bid $18.6 million. The final price with the buyer’s premium was $21.2 million, well ahead of the $18 million high estimate. But, overall, the sale was a bit of drag, with the absence of the night’s biggest lot putting a damper on the proceedings. It was always a risk to price the painting that high—in presale spin, the house tried to make the point that this was a “breakthrough masterpiece,” a work that showed the artist entering the peak of his power. But perhaps potential buyers simply saw it as an early work and believed that only a golden-era Schiele—like the one that sold at Sotheby’s in London in 2011 for $39.8 million—should be priced that high. After the Malevich, people started to stream out of the room. It was a relatively brisk 50-lot sale, but behemoths loomed on Wednesday and Thursday night. The source of quality Impressionist and modern pictures may be dry at the moment. Then Nash walked out, and, in a rare breach of civility at the house, a server fumbled a glass champagne flute on a tray and it shattered all over the floor. The New York sales continue tomorrow with the postwar and contemporary evening sale at Christie’s.